over the years it’s grown from a BNC based 10mbit LAN running Netware 3/Win 3.x, through Netware 4/NT4, Slackware Linux and all variants of Windows 200x/RedHat. 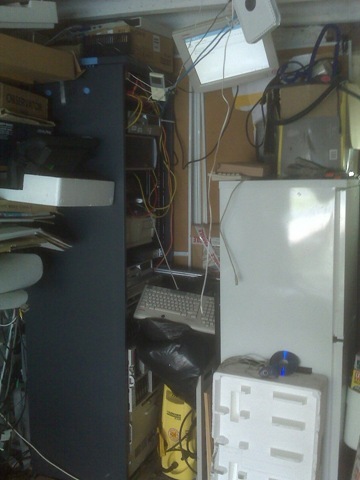 Around 2000 I started to make heavy use of VMware Workstation to reduce the amount of hardware I had (8 PCs in various states of disrepair to 2 or 3 homebrew PCs) in latter years there has been an array of cheap server kit on eBay and last time we moved house I consolidated all the ageing hardware into a bargain eBay find – a single Compaq ML570G1 (Quad CPU/12Gb RAM and an external HDD array) which served fine until I realised just how much our home electricity bills were becoming! 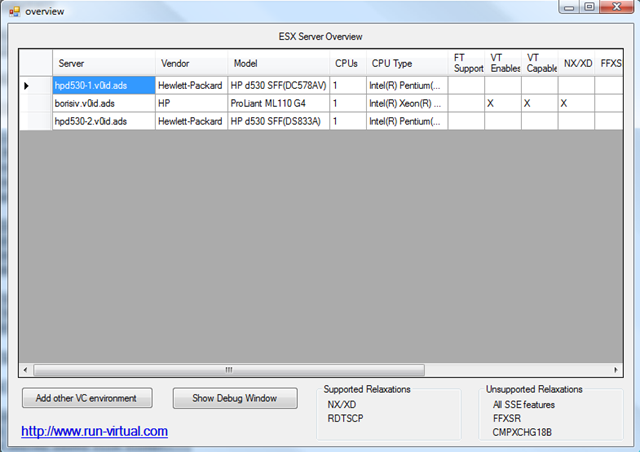 I’ve been using a pair of HP D530 SFF desktops to run ESX 3.5 for the last year and they have performed excellently (links here here and here) but I need more power and the ability to run 64 bit VMs (D530’s are 32-bit only) I also need to start work on vSphere which unfortunately doesn’t look like it will run on a D530. Resource pool for “production” home services – MP3/photo library etc. 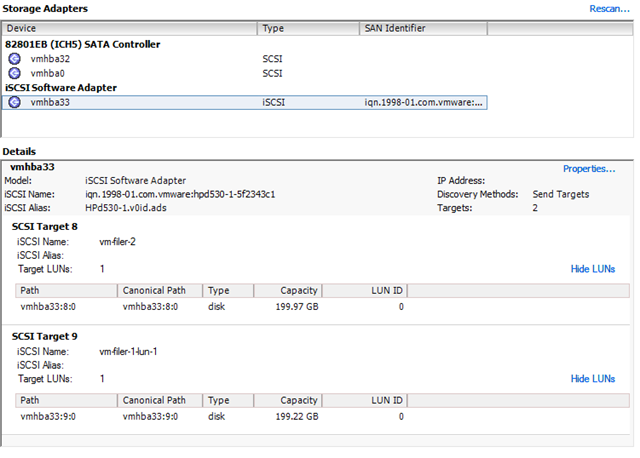 iSCSI SAN (OpenFiler as a VM) to allow clustering, and have all VMs run over iSCSI. Cheap Netgear switch with only basic VLAN support and no budget to buy a decent Cisco. Luckily I’m looking to start from scratch in terms of my VM-estate (30+) most of them are test machines or something that I want to build separately, data has been archived off so I can start with a clean slate. 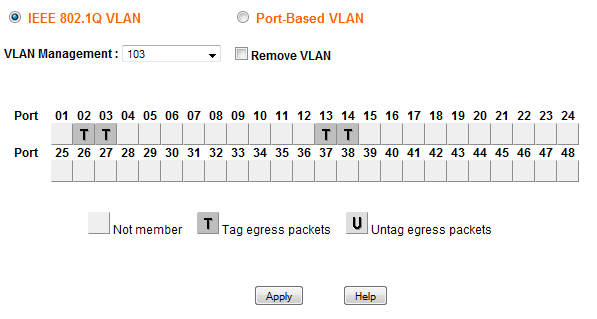 I also need to make sure the Netgear switch had the relevant ports set to T (Tag egress mode) for the VLAN mapping to work – there isn’t much documentation on this on the web but this is how you get it to work. The vSwitch configuration looks like the following – note these boxes only have a single GbE NIC, so all traffic passes over them – not ideal but performance is acceptable. Techhead has a good step-by-step how to setup an OpenFiler here that you should check out if you want to know how to setup the volumes etc. if it helps my target naming convention was vm-filer-X-lun-X which means I can have multiple filers, presenting multiple targets with a sensible naming convention – the target name is only visible within iSCSI communications but does need to be unique if you will be integrating with real-world stuff. Because I have a non routed L3 network my storage is all hidden in the 103 VLAN, to administer my OpenFiler I have to use a browser in a VM connected to the storage VLAN, I did play around with multi-homing my OpenFilers but didn’t have much success getting iSCSI to play nicely, it’s not too much of a pain to do it this way and I’m sure my storage is isolated to a specific VLAN. The 3.5 cluster will run my general VMs like Windows domain controllers, file servers and my SSL VPN, they will vMotion between the nodes perfectly. HA won’t really work as the back-end storage for the VM’s live inside an OpenFiler, which is a VM – but it suits my needs and storage vMotion makes online maintenance possible with some advanced planning. Performance from VM’d OpenFilers has been pretty good and I’m planning to run as many as possible of my VMs on iSCSI – the vSphere cluster running on the ML110’s will likley use the OpenFilers as their SAN storage. This is the CPU chart from one of the D530 nodes in the last 32hrs whilst I’ve been doing some serious storage vMotion between the OpenFiler VM’s it hosts. Great post, wonderfull lab. It’s a shame that the Openfile runs in a VM (or choice to save on electricity bill?…-:) ). It’s for a real beginners, with a schema. 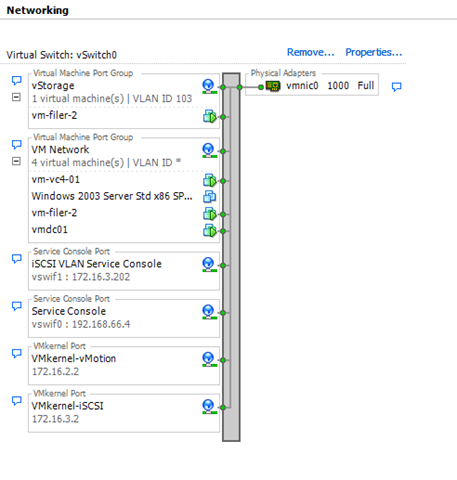 for your routing needs, you should look at the opensource vyatta solution as it can run in vm. i am planning my lab env now, as a citrix consultant. i am planning to implement 4 hosts, 2 citrix/xen hosts and 2 microsoft/hyperv hosts. looking at hardware to implement as i have very limited space in my townhouse as well. What is the model of the basic netgear network switch that you bought? What would be your decent recommended switch? I am buying components for my lab, so your inputs will help. Thanks in advance. What is the netgear switch that you bought with the bais vlan support? Also, what is decent cisco model that you would have liked and why? I am building a home lab and your inputs will help me buy the right gear. Thanks a bunch. 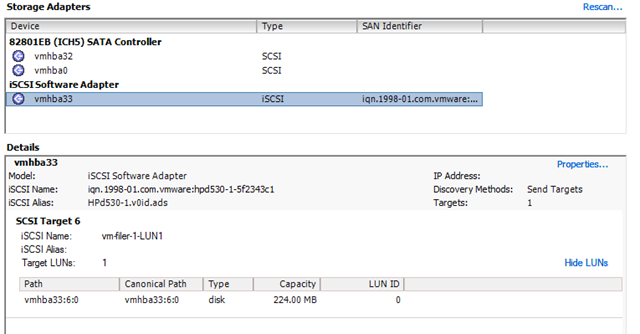 I have two openfiler virtual appliances; one on each of my esx hosts. If i want to reboot one of my esx hosts I need to power down the openfiler on that host. This causes the esx host to hang while unmounting the filesystem from the downed openfiler VM as the iSCSI storage is no longer available to ESX. Is there a way to script the unload of the filesystem when shutting down the openfiler VM and mount it again when it starts up again? I would like to build my lab in a similar fashion. Can you please post the model number of the switch that you used in your lab? Thanks for all of the information. The switch I am using is a Netgear GS748T; but to be honest there are cheaper and quieter options – keep an eye on the blog; there will be a series of joint postings with http://www.techhead.co.uk on the current lab setups with all the full tech details and where to buy etc. 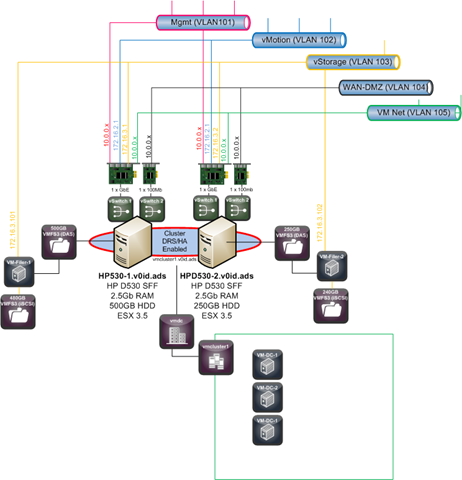 Hi there, just wanted to know if you could provide some more detail on how you got ESX working with VLANS on the GS748T switch. We have two switches setup as trunk back to router, but when we set the ports for ESX Server as tagged we cant communicate. Only works when they are untagged. Any support would be great. Nick – I’ve got mine set to ‘Tag Egress’ packets for the relevant VLAN using 802.1q VLAN on the switch port and it works ok – the UI is a bit odd, but you need to make sure you select the correct VLAN in the drop down /then/ set the T/U setting for the relevant switch port and make sure the PVID isn’t set on those ports. 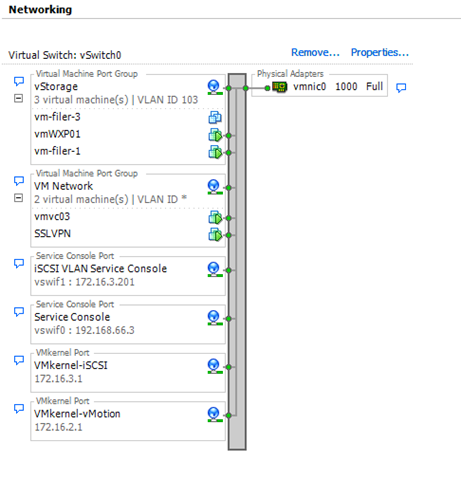 but my ESX hosts are happily accepting multiple VLANs up and down their ‘T’ ports but by design my OpenFiler boxes are only available on my storage VLAN and are plugged into ports with Port based VLAN’s set (PVID) and I had to set those ports to ‘U’ (Untag egress packets) to get it to work. I will try to do a blog post with some screenshots of my switch config in the next couple of days, but I’ve only got a single switch so I can’t try out your configuration unfortunately. I have the chace to buy 4 ML110 G4 very cheap and have found a couple of posts on the internet claiming that they will not support 64 bit guest OS. I noticed that you are using two ML110 G4, so I just wanted to ask you if you can confirm that they do NOT support 64 bit guest OS? Mine are running vSphere 4 and can run x64 guest’s – you prob need to check which CPU’s they have – mine are the Intel Xeon ones, I’ve seen a fair few cheap ones around, but they are the non-Xeon chips (AMD/P4 etc.) – which maybe don’t do x64 I’ve not had one so I don’t know specifically I’m afraid. Ok, thanks for the responce. I checked the CPUs just now and it’s Intel Xeon 3040 in all 4 of them. That looks promising, thanks for the help! Great – my G4 has a 3040 CPU and it runs vSphere and x64 guests fine; no FT support – but works perfectly for me otherwise. 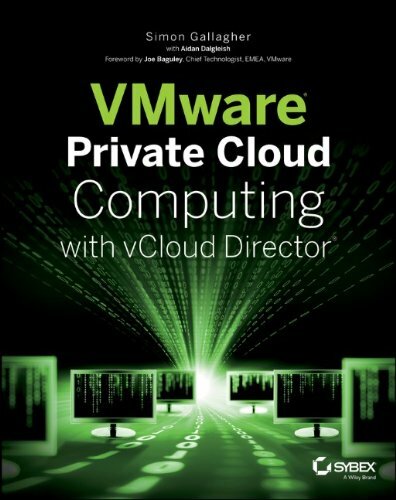 hi there, will this hardware adequate to run vsphere and 64bit vms using vmware workstation on a single physical host?